In this paper, we propose a new mechanism to improve the disadvantage of the security mechanism proposed by a scholar and then fulfill the demands of Internet of Things (IoT) to go through the decentralized environment access control functions. 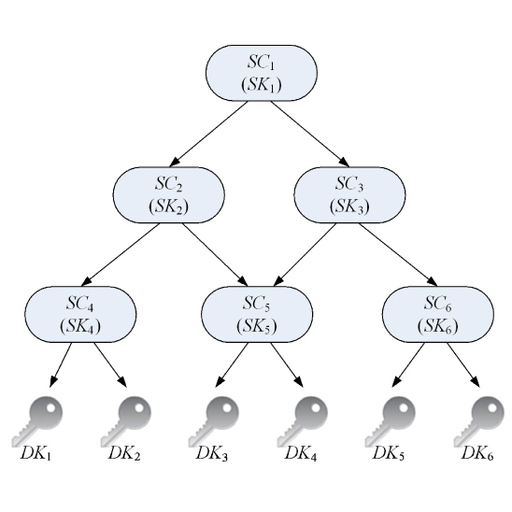 We also propose the date-constrained hierarchical key management scheme for mobile agents. With elliptic curve cryptosystems (ECCs) and discrete logarithms, the proposed scheme is flexible. Moreover, the duration of access for each security class is restricted with a certain authorized discrete time period. We demonstrate the mathematical derivation and arguments for our scheme and further conduct a numerical trial. The constructed scheme could meet security needs and be more space-efficient. Tsung-Chih Hsiao, Tzer-Long Chen, Tzer-Shyong Chen, and Yu-Fang Chung, Elliptic Curve Cryptosystems-based Date-constrained Hierarchical Key Management Scheme in Internet of Things, Sens. Mater., Vol. 31, No. 2, 2019, p. 355-364.